This is hella frustrating. Just bought this wireless USB card about 30 minutes ago, and I explicitly asked the sales clerk if it worked with Macs. "Yes," she lied, though she was very nice about it. What happens is you put the stick in your mac, and it's mounted as a CD image. 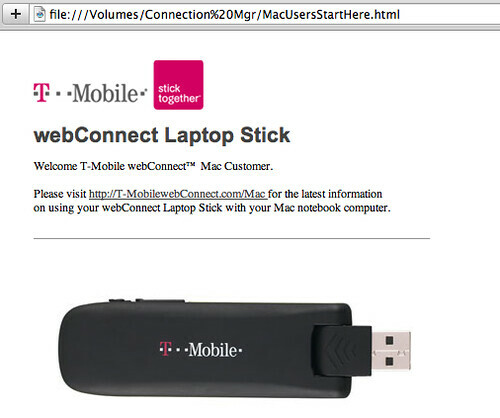 There's an html file on the drive titled "MacUsersStartHere.html" and apparently that's where their Mac support ends. What you see next is a web page that directs you to another web page (http://www.t-mobile.com/promotions/genericregular.aspx?PAsset=Pro_Pro_webconnect) that says Mac support is "coming soon!" Yes, they have an exclamation point. They are very excited about their non-support for Macs. Meanwhile, I need to return what is apparently a $60 / month html file.